Bagan had a mystical appeal to us the second we saw photos of it. This UNESCO World Heritage Site is home to the largest concentration of stupas, temples and pagodas in the world. The immediate landscape is relatively flat, so when you climb to the top of a temple, you can see scores of other pagodas peeking through treetops in the distance. It’s an unreal view. View of the temples of Bagan. Starting in the 11th century, thousands of Buddhist temples, pagodas and monasteries were built on the sandy plains of the capital city of Pagan (Bagan). After the Pagan Kingdom’s collapse in 1287, the capital was moved and the area was all but forgotten. Earthquakes and erosion have left many of the site’s structures in ruins, though many have been restored or reconstructed in the last few decades (many historians claim that this process is being carried out without regard for the structures’ original appearance). We arrived weary at 3:20am via an overnight bus from Yangon. The 8-hour ride was a nightmare for Mike, who started feeling the crippling effects of food poisoning en route to the Yangon bus station. I hadn’t seen him in such miserable conditions since his last bout of food poisoning in India. Our bus didn’t have a toilet on board, so Mike was the first off each time we pulled into a rest stop. But even these stops were not enough. He got to use — for the first time in his life — one of the motion sickness bags onboard. Like a good wife, I brought it to the attendant at the front of the bus. He asked where we were sitting and walked back with me. He then opened the window and chucked the bag out. Yes, there was a lane next to us. No, he didn’t look before tossing it. If you read our first Myanmar post, you already know that they have no qualms when it comes to littering. We were so thankful to arrive at 3:20am, which was two hours before our quoted arrival time. When disembarking the bus, we were swarmed by the usual touts eager to drive us to our guesthouse. One guy latched onto us before we could even collect our luggage and kept asking where we were going. When we told him New Haven guesthouse, he insisted they were closed for renovations. Additionally, he quoted us three times the going rate for the ride, and we were in no mood to be swindled. We started to walk away when he said, “I can take you by New Haven if you don’t believe me.” We didn’t believe him because we called ahead and made a reservation with an actual person. When we told him that he said he didn’t know how that could be. Then other drivers started chiming in, agreeing that it was closed. There were so many of them concurring that we started to believe them. Our only other option was to find a new guesthouse. 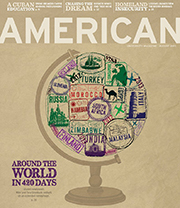 Luckily, we had a Lonely Planet guidebook with us. We took it out to see what we had marked as our number two choice: New Park. It was just down the street from New Haven and about 800 meters from the bus station. But the driver was still quoting too high of a price for such a short distance. So we continued toward the guesthouse. Surprisingly, he didn’t follow us. We didn’t actually want to walk so we could get Mike into a room as soon as possible. But he was ok with walking if the driver wasn’t going to be reasonable. Is it weird that we’d rather put ourselves through hell than get ripped off? As we approached the road, we heard a voice behind us. Another driver was offering the right amount, so we jumped in his one-horse carriage (this is the typical mode of transportation around Bagan, not tuk tuks). Our room at New Park guesthouse that Mike got awfully comfortable in. The rest of our arrival day was a rest day. Mike mostly slept and drank as much water and 100 Plus (an isotonic drink made in Malaysia) as I could bring him. While he was resting, I explored the area. New Park guesthouse is located in Nyaung U, which is a small town near Old Bagan and New Bagan that has many hotels and restaurants but few temples and ruins. There wasn’t a lot to see, and I didn’t want to head to the temples without Mike. I did, however, come across New Haven guesthouse, which was completely under construction. We later realized that we probably made the phone reservation with New Park. 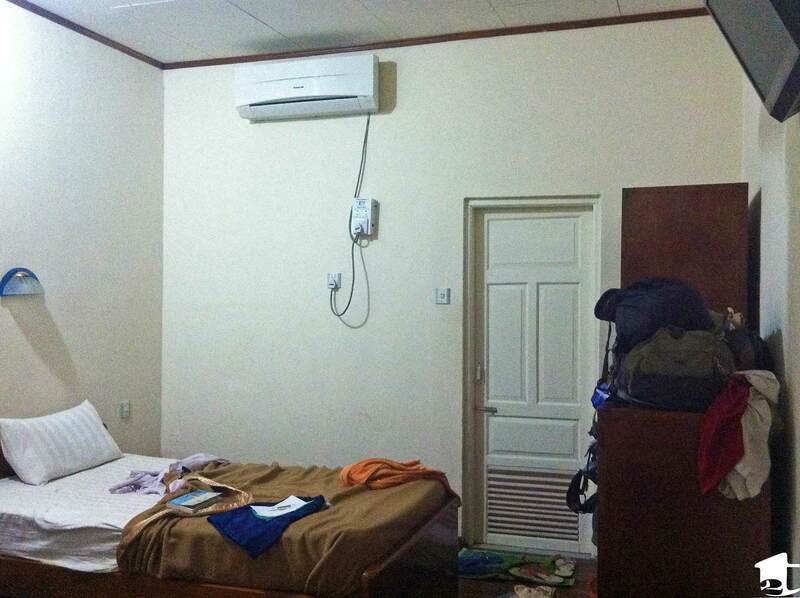 Our Yangon guesthouse had given us the number, but there must have been a miscommunication with the name. In the early evening, I went for a run in the direction of Old Bagan. Temples towered on either side of me and stood above trees in the distance. Saffron-robed monks strolled along the sandy paths and smiled as I ran by. I wondered what they thought of all these ancient Buddhist temples. Did these sights take their breath away? Did they try to imagine what it was like to be a monk in Pagan in the 12th century? The next day, Mike was feeling better. We decided to rent bicycles to explore Old Bagan, where many temples are in close proximity to one another. The temples in New Bagan are more spread out, so we planned to hire a horse carriage the following day to see them. We took off on our bicycles, and I kept a close eye on Mike. We stopped a few times within the first half hour to walk around temples just off the main road. One of the larger and more architecturally interesting temples was just up ahead, but we stopped short to look at some interesting statues. I was taking photos when our camera stopped working. It showed a battery error. This wasn’t the first time this has happened, so I gave it the usual fix. When I turned the camera back on, it now showed a memory card error. This, we know from experience, could only be fixed by inserting the card into a computer, which meant we would have to turn back if we wanted to continue taking pictures. As we were discussing our options, Mike began to feel unwell again. The combination of the heat, biking and lingering food poisoning left him convinced he should take another day off to rest, so we turned back. Once at our guesthouse, Mike insisted that I take the bike out to see more temples. View of Buddhist temples from the top of a temple in Bagan. I barely cycled back to the point where our camera broke when I felt something wrong with the bike. I turned off the road and looked down at a flat front tire. Greaaaat! I was now miles from our hotel. Two tourists had just stopped as well and saw me examining the tire. They pulled out a pump even though we all knew it wouldn’t help. After putting air into my tire, we watched it slowly deflate. I thanked them for their help and, realizing I wouldn’t be cycling further that day, walked around for a bit to take pictures with my now-fixed camera. After going around the nearby temples, I brought my bike to the side of the road and started to walk it toward the hotel. The route back felt even longer as the sun blazed down and cars and motorbikes kicked up dust as they sped past. To my surprise, the two men who had pumped my tire returned to help. They wanted to help me get back to town and offered a solution: I would ride one of their bikes while they doubled up and towed my bike alongside. I thanked them for their generosity and said they didn’t have to do that, but they insisted. They biked ahead of me uphill and over potholes, all the while holding onto my bike’s handlebar. I couldn’t believe their generosity — they were certainly going out of their way to help me out. It was one of those moments that not only restores your faith in human kindness but also makes you want to pay it forward. I was extremely grateful. It was not an easy thing they were doing, so they weren’t able to bring me all the way into town. We stopped a two-minute walk from a roadside makeshift gas station (I’m using that term very lightly). It’s common to find locals setting up shop on a small patch of empty land. Typically, these small “stations” supply gasoline since modern gas stations don’t exist around town. 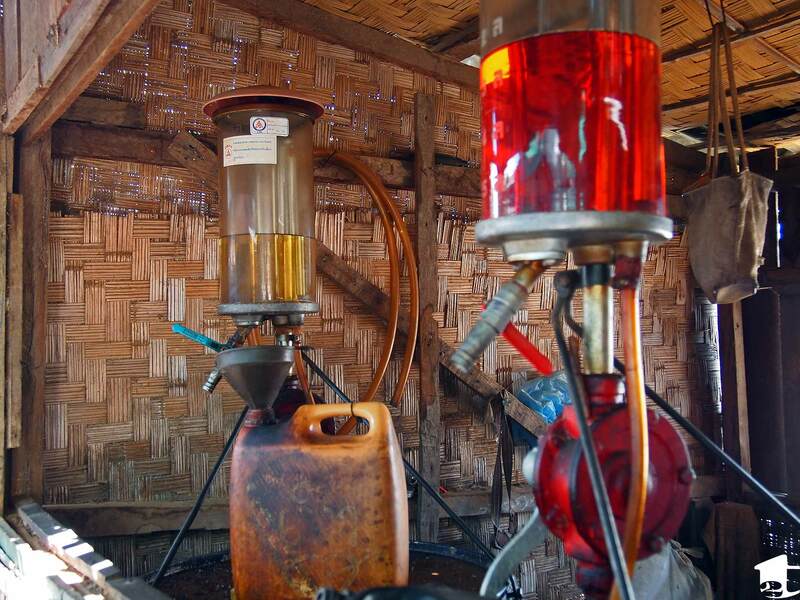 They fill alcohol or water bottles with gasoline, then they dump the contents into motorbikes or tuk tuks that stop to refuel. In addition to supplying gas, this guy had everything necessary to patch up a punctured tire. Gasoline containers you may find at one of the many makeshift gas stations. Flat tires are very common in Bagan. The main road and sandy paths leading to the temples are filled with debris. There were even about a dozen patches on my tire’s tube when he took it out. After my tire was fixed, I rode back to check on Mike and bring him more 100 Plus. He still wasn’t feeling well and wanted to rest for the night. I decided to ditch the bike and put on my sneakers for another scenic run. This time, instead of simply looping back halfway through, I jogged to the bottom of a large pyramidal temple. My shorts were a little too short for entrance into a religious monument (though gatekeepers seemed more concerned about revealing tops) and I didn’t have my Bagan Archeological Zone pass with me (read: entrance pass), but I wanted to take my chances. I ran to the back entrance, untied my shoes and slipped off my socks, leaving them at the foot of a steep, high stairway. 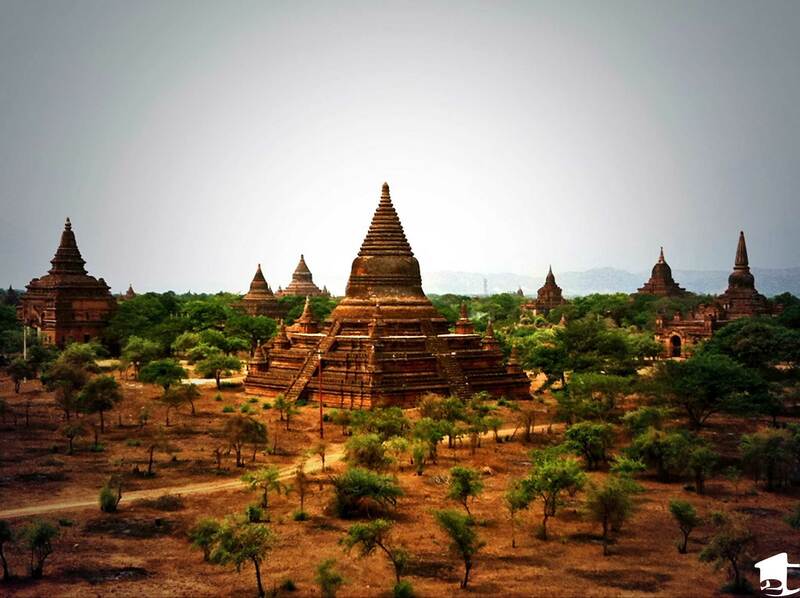 When I reached the top, I had my first sweeping view of the brick-red ancient temples of Bagan. A handful of other tourists were also around, snapping photos and setting up their tripods for sunset. We all had the same slack-jawed smile, speechless at the sight of an amazing 360-degree view. I couldn’t wait for Mike to see it too. The next day, my hubby was feeling better and ready for a full day of exploring temples. It was cloudy out and had rained on and off the last two days, but we weren’t going to let that stop us from seeing the fields of temples we came for. Since it was our last day in Bagan, we wanted to maximize our time. We hired a horse carriage driver from morning until the afternoon. Others had recommended it, and it was a great way to efficiently see the most well-known temples and other interesting ones along the way. The large whitewashed temples of Ananda Pahto and Gawdawpalin are some of the area’s biggest attractions. They are monstrous, gorgeous examples of ancient Buddhist architecture that I could have mistaken for palaces if I didn’t know any better. Once inside, high vaulted ceilings make way for towering Buddha figures that remind you that you’ve walked into a place of worship. Each temple exemplifies the Southeast Asian slogan of “same same but different.” Paintings have been preserved on some walls, while others are bare and bland. Stacks of crumbling bricks stand where a fortified temple used to centuries ago. We saw a lot of temples in Myanmar but never felt “templed out,” as so many travelers do. They’re all so different and beautiful in their own way. And the large sandy plains of Bagan are fun to explore. Any path you take will lead you to a temple that is unlike the rest. Maybe you’ll find a monk meditating inside. Or the offerings of lotus flowers, hard-boiled eggs and a beverage with a straw will force another smile across your face. 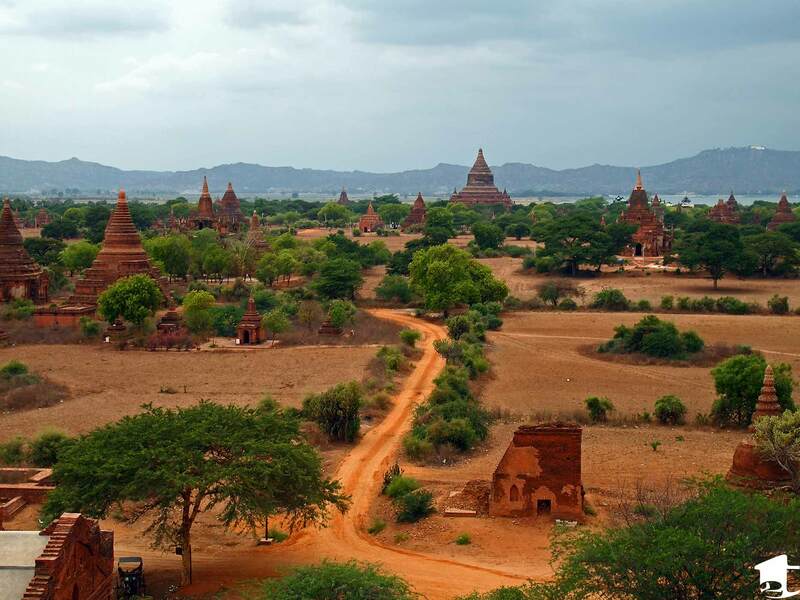 You could easily spend three full days exploring what the Bagan area has to offer. There is more to see than just the temples, like nearby Mt Popa and the thanakha museum in Nyaung U. A local told us we could go to a nearby village to watch them make peanut oil (tip: it’s near the Bagan Nan Myint Viewing Tower). Unfortunately, we only had a week left in Myanmar and still wanted to go trekking and spend a couple days at Inle Lake. Instead of spending more time in Bagan and skipping another city, we boarded a bus to Kalaw the next day. Stay tuned for our trekking experience! What would a post be without a photo of delicious food? 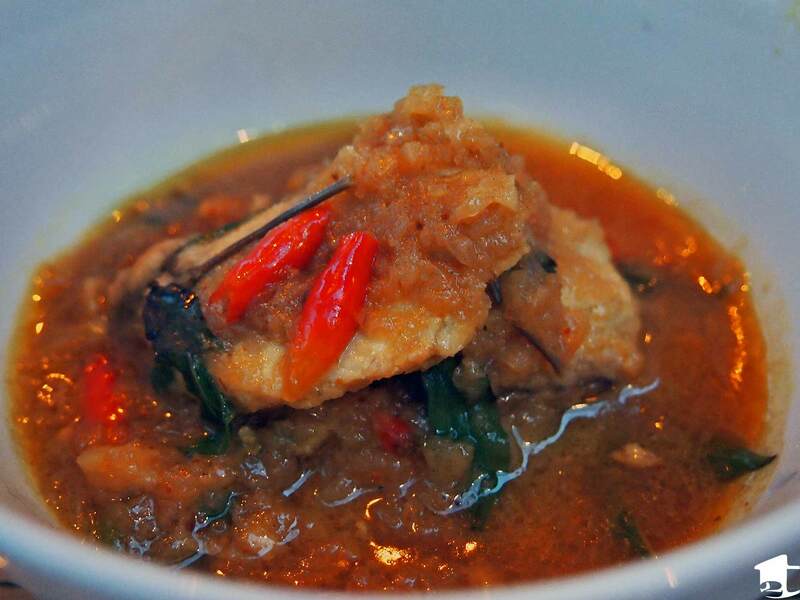 Here’s Bibo’s tamarind fish curry. Dinner at Bibo restaurant in Nyaung U: 7,500 kyats. This included two tamarind fish curries with rice, two tomato salads, two Tom Collins, one mango daiquiri, and one mint julep (happy hour drinks are buy one get one free). We highly recommend this restaurant run by a young married couple. The tamarind fish curry was delicious! Find out here why we choose to use Myanmar instead of Burma. Determine a budget for your trip to Myanmar. This entry was posted in Destinations and tagged adventure, advice, Asia, backpacking, Bagan, Buddhism, Buddhist temples, Burma, monastery, monks, Myanmar, narratives, New Bagan, Nyaung U, Old Bagan, Pagan, rtw, Southeast Asia, stupa, temples, thoughts, tips, transportation, travel. Bookmark the permalink. Ahh… A series of unfortunate events! Something we travelers are very familiar with. A friend of mine was also food poisoned but thankfully it happened after our Bagan visit. And yes, the trails to the temples are very challenging as attested by my backpacking buddies (I took the horse-drawn carriage cause I brought my 2-year old with me). Yea, the bikes they rent are in pretty shabby shape for the trails. If Mike wasn’t sick we probably would’ve been better off jogging between all the temples. But the horse carriage was enjoyable. Hopefully things will go better now and no more food poisoning. That’s a hard thing to deal with. I kid you not, I had horrific food poisoning and a flat tyre and I also recovered at the New Park Hotel! Staff there were great, Bagan beautiful of course. Flat Coke, plain rice and watermelon saved my life (not to mention the antibiotics the doctor brought me). All the best, lovely blog.